They’re about the pros rather than the amateurs. Which may be why they’re so cavalier about exacting fees and penalties on individual depositors at levels they’d never consider applying to professional markets. Indeed, pretty good research suggests that as banks get bigger — which tends to mean more competitive on the global financial market — they begin charging consumers more. This seems to be true. Take a look at the chart on the right from today’s Wall Street Journal. It shows that banks receiving bailout funds have increased fees at a far higher rate than banks that haven’t. Does this show that banks receiving federal assistance are more likely to raise their fees and penalties? Of course not. This trend is nine years old. 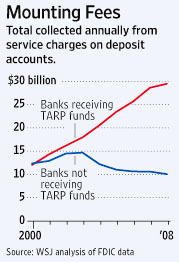 However, it’s big banks that have received most of the TARP money, so you can pretty much replace “Banks receiving TARP funds” with “Big banks.” So what the chart shows is that big banks have increased their fee and penalty structure far more than small banks. Why? Because they can. And in the past they’ve wielded enough political power to prevent Congress from doing anything about it. If there’s any justice — and needless to say, that’s still an open question — those days are finally gone.